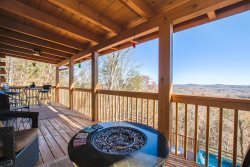 Garden House is located only 8 miles from downtown HELEN, GA. Nestled in the Blue Creek Resort, it gives easy access to all of what Blue Creek Cabins has to offer! Walking distance from our PRIVATE trout pond and the BLUE CREEK. Listen to the creek as you relax on the back porch swing or while soaking in the Hot Tub. This cabin is recommended for 2 adults only. Children are welcome. The master bedroom features an electric FIREPLACE, SAUNA for 2, a HUGE King Arthur Jacuzzi tub with a waterfall shower head & endless hot water. A WATER FOUNTAIN and a FLAT SCREEN TV are also special features of the master bedroom. This Cabin has FREE WiFi, another Flat Screen TV in the living room area and a second bedroom. It has a full game room upstairs, with a FULL SIZE POOL TABLE a FOOSBALL table and a treadmill. This cabin is designed for a couple to come and enjoy the nature that surrounds the cabin. Cook your favorite meal in the newly upgraded, spacious kitchen with the biggest heart pine bar built to date. Don’t forget when the season is in to ask about using fresh picked herbs from the garden. We are confident that you will enjoy your stay here at this luxury cabin. No washer/dryer. Please ask to use office laundry area. This Cabin is Adjoined to Another Cabin.